Half the antibiotics released into the environment end up in water, says a new report, with the other half in soil. From there, antibiotics enter into the human food chain, increasing resistance and with it the likelihood we’ll one day be left with effective antibiotics for medical use. The report, published this month by a research group led by Ying Guangguo, of the Guangzhou Institute of Geochemistry, part of the Chinese Academy of Sciences, is the first in the country to examine the use and emission of antibiotics. Among its findings is that China is the world’s largest producer and user of antibiotics; in 2013 alone, China used 162,000 tonnes of the drugs – about 160 times usage in the UK. Use in humans accounted for 48% of this, with the remainder used in livestock farming. This lack of data, Ying adds, was his motivation to complete this research – in China there is no official reporting of usage of the various antibiotics. Ying started out hoping to get some figures from government departments, but visits to environmental, agricultural, health and food and drug health authorities all proved fruitless. Livestock farmers, when asked, all denied ‘ordinarily’ using antibiotics. Tests, however, found a range of antibiotics in the fodder and manure at nearly all large farms. Ultimately this was used to produce two maps of antibiotics pollution: one showing the quantities of antibiotics discharged nationwide, the other the concentrations of antibiotics found in water samples. The maps show antibiotic pollution is common in China’s rivers. The Hai and Pearl rivers are the most badly affected, with an average concentration of 79.3 kilogrammes of antibiotic per cubic kilometre, dozens of times that of the Bramaputra in the west. Generally speaking, antibiotic pollution is worse in rivers in China’s north. Dongting Lake ranks highest in terms of total discharge of antibiotics, at 3,440 tonnes. The Yellow, Huai and Yangtze basins all rank among the highest in terms of total discharge, all at over 3,000 tonnes. Antibiotics emissions are lower in the Bei river and the Pearl River delta. Half of antibiotics used in China are given to livestock. In 2007, for instance, the US Food and Drug Administration warned that some farmed fish from China contained fluroquinolones, an antibiotic banned in the US. Water treatment plants are often unable to deal with antibiotics. Ying also found many farms just dump waste water directly into rivers, or use it for irrigation. Currently, China has no clear standard for levels of antibiotics in waste water (even indices for waste water from the pharmaceutical industry don’t list antibiotics). “So there’s a regulatory blind spot here,” explained Chen Chao, a deputy researcher at Tsinghua University’s Institute of Drinking Water Safety. Overuse of antibiotics has led to the emergence of drug-resistant bacteria. Chinese farmers add small quantities of antibiotics to fodder, not to treat sick animals, but to promote growth and to reduce the risk of cross-infection due to cramped conditions. Only a small part of the dose is absorbed; most ends up in the animals’ excrement. In 2013, a study by eight Chinese and American scientists published in the US journal Proceedings of the National Academy of Sciences, found 149 unique resistance genes in the manure from three large Chinese pig farms. These drug-resistant bacteria can be transmitted to the human body through the environment or consumption of meat from those farms. Some evolve to become ‘superbugs’ – infections that are difficult or even impossible to treat with conventional antibiotics, with research into new drugs unable to keep up. The danger is real: in April 2015, a year-long study of antibiotics in the urine of 1,000 schoolchildren in Shanghai, Jiangsu and Zhejiang, carried out by a team at Fudan University’s School of Public Health and led by deputy professor Zhou Ying, found that in almost 60% of samples, at least one antibiotic was found, with two found 25% of the time. In some cases, as many as six antibiotics were identified. The misuse of antibiotics and drug resistance are global public health issues, with doctors faced with a decreasing range of choices and a lack of time in which to make decisions, and often troubled by difficult choices about how to save their patients. Every year at least two million Americans get ill, about 23,000 of whom die of drug-resistant infections. Antibiotics can save lives, but the consequences of misuse are worrying. Academics look to standardised management of antibiotics as a solution, to ensure patients of the future aren’t left without any options. 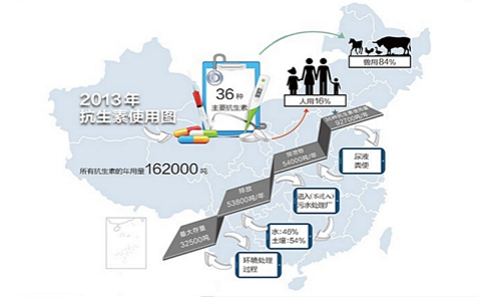 Guan Xiaodong, who researches the use of medicines within Peking University’s Department of Pharmaceutical Administration and Clinical Pharmacy, points out that in China the use of antibiotics in human and veterinary medicine are currently managed separately – by health and agricultural authorities, respectively. Recent years, however, have seen use of antibiotics in human medicine brought under tighter control. Strict new rules were put in place on the clinical use of antibiotics in August 2012, with tougher management of the drugs both in hospitals and pharmacies seen since then. Agricultural authorities have also repeatedly published lists of banned antibiotics, but enforcement of these rules at China’s numerous small-scale farms is difficult. “In comparison, the EU and US have already banned the use of antibiotics to accelerate growth, while the US and Australia are in the process of banning a wider range of antibiotics,” Guan said. In December 2013 the US Food and Drug Administration issued industry guidance in the form of an update to the Veterinary Feed Directive, calling for veterinary oversight of the use of antibiotics. A typical example was the March 5, 2015, announcement by fast food chain McDonald’s that over the coming two years its 14,000 US restaurants would phase out chicken from farms that use antibiotics also used in human medicine. Chen Chao thinks a cross-departmental approach to the use of antibiotics in farming is key. He hopes to see the government bolster efforts to combat the misuse of antibiotics in livestock rearing, as well as provide farmers with more guidance – and, when necessary, require veterinary antibiotics only be administered by a trained vet. Could you provide a link to the report or the name of it?